Max Beerbohm is an acquired taste. He has that witty, fin-de-siècle style reminiscent of the authors of the 1890s - Oscar Wilde & the writers at The Yellow Book are probably the best-known examples. Beerbohm's essays remind me of the languid figures in Aubrey Beardsley's drawings. I'm never quite sure when he's being serious but then, that's half the fun of reading his essays. The only other book by Beerbohm that I've read is Zuleika Dobson, a complete fantasy about a girl so beautiful that whole groups of Oxford undergraduates fall into the river while gazing at her. Complete nonsense but a lot of fun to read. I felt a little like that about the essays collected in More. This book was published in 1899, when Beerbohm was only in his late 20s. It was his second book of essays (hence the title) & I think the best way to read them is to read one or two at a time. That's what I did, I read one nearly every night & although I'm sure I didn't always catch the irony, I did enjoy reading Beerbohm's opinions on the many subjects he pokes fun at here. After the first day or so, my melancholy leaves me.The very loneliness of the place does but accentuate my proprietary sense. From the midst of all this lifeless monotony I stand out, a dominant and most romantic personage. Were I in London, who would notice me, no prince there? Even here, in the Season, I had but a slight pre-eminence over other visitors. But now I need but show myself to create a glow of interest and wonder. The blind man, standing by his telescope, knows my tread and tries, I think, to picture my appearance. The old gentlemen see in me the incarnation of splendid youth; the shop people, a dispenser of great riches; the school-girls, a prodigy of joyous freedom from French verbs. I could not have levied these tributes in the month of August. Are you a jeweller? You fill your window with a garish and unseemly chaos of all you have : bracelets, sleeve-links, penknives, tiaras - toute la boutique. Your rival in Paris, even in New York, is much wiser. He understands the value of a reticent symbolism. Very little he puts into his window. What he puts is good. Men and women, beholding, praise it. Their imagination has been stirred, their appetite whetted from the things that are withheld, and they long to enter in at the door. Last winter, in the Rue de la Paix, I saw a jewel-window, sir, that should serve for an example to you. It was lined with scarlet velvet and illustrious with electric light. In the very middle of it, lay, like a bomb in a palace, one beautiful black pearl. Had I been rich, I must have entered. He manages to insult the local jeweller, give a back-handed compliment to New York & exult himself as an arbiter of good taste while also admitting that he hasn't the money to afford the beautiful things he craves. Not that I had any special reason for hating school! Strange as it may seem to my readers, I was not unpopular there. I was a modest, good-humoured boy. It is Oxford that has made me insufferable. At school, my character remained in a state of undevelopment. I had a few misgivings, perhaps. In some respects I was always too young, in others, too old, for a perfect relish of the convention. As I hovered, in grey knickerbockers, on a cold and muddy field, round the outskirts of a crowd that was tearing itself from limb to limb for the sake of a leathern bladder, I would often wish for a nice, warm room and a good game of hunt-the-slipper. And, when we sallied forth, after dark, in the frost, to the swimming-bath, my heart would steal back to the fireside in Writing Home and the plot of Miss Braddon's latest novel. Finding no pleasure in a freedom which they have always had, incapable of that self-control which long discipline produces, they will become neurotic, ineffectual men and women. In the old days, there could have been no reaction of this kind. The strange sense of freedom was a recompense for less happiness of heart. Children were fit for life. What would Beerbohm have thought about children's fashion labels, babycinos & the abolition of prize-giving at sports days because "everyone's a winner"? Other essays on the state of the music hall, the novels of Ouida & Madame Tussaud's waxworks are equally entertaining. You probably know by now whether or not Max Beerbohm is for you. Simon has also reviewed More in the latest issue of Shiny New Books. 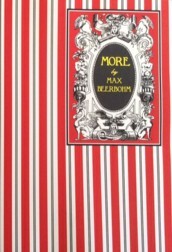 The publisher, Mike Walmer, kindly sent me a copy of More for review. He sounds interesting. Right now I'm working my way through a book of essays by Robert Louis Stevenson, but I will keep Beerbohm in mind for a future read. Do you know what the name of his first book of essays is? I can't think of two writers more different than RLS & Beerbohm! I'd be interested to see what you think. MB's first book of essays, published when he was 24, is called The Complete Works of MB! He certainly didn't lack confidence. Thanks for the title. Yes, they do sound different. I imagine he rather polarises tastes! You've picked excellently representative bits from More to help people make up their minds. I loved it, but if I thought for a moment he was being serious about half of what he said... !! I did find it hard to tell how serious he was sometimes & he often sounded like a bored middle-aged man but I did enjoy it - in small doses. The comparison with Aubrey Beardsley's languid gentlemen is uncanny - I laughed out loud! I've read and enjoyed Zuleika Dobson, but haven't attempted anything else by Beerbohm, and those quotes you've selected do sound enticing. I couldn't get Beardsley's drawings out of my head as I was reading. I think if you're interested in that period, you'd enjoy the essays. You're welcome, Mike, I enjoyed reading it.